The 2018-2019 flu season in Aroostook County has seen a far lower number of confirmed flu virus cases than last year’s totals and the current statewide average. AROOSTOOK COUNTY, Maine — The 2018-2019 flu season in Aroostook County has seen a far lower number of confirmed flu virus cases than last year’s totals and the current statewide average. According the Maine Center for Disease Control and Prevention, only 153 individuals in Aroostook County have tested positive for the flu during the past season compared to 768 people during the 2017-2018 season. There have been no hospitalizations of individuals affected by either Influenza A, also known as H1N1, or Influenza B whereas last season 41 people were hospitalized. The most recent Maine CDC data reveals that 510 people have tested positive for the flu statewide and 53 have been hospitalized. Three people have died from the virus so far this season. None of those deaths occurred in Aroostook County. Those numbers come one year after Maine witnessed its worst flu season in at least five years, with the CDC reporting 9,018 total cases for the 2017-2018 season, which marked an increase of 55 percent from the previous season. Linda Foley, manager for infection prevention and patient safety at Northern Light A.R. Gould Hospital in Presque Isle, noted that all those numbers do not include patients who did not receive the influenza test from their primary care provider or did not go to a hospital after experiencing flu symptoms. Foley credits northern Maine’s decrease in flu cases to the geography of the region and the lower populations of people that make the spread of disease more difficult. In addition, the colder, longer winters of Aroostook County tend to slow the spread of the disease. Despite some nationwide skepticism surrounding the flu vaccine, Foley stated that this season’s version of the vaccine has been 95.6 percent effective in preventing Influenza A and at least 70 percent effective in preventing Influenza B. Common misperceptions about the vaccine are that it contains preservatives and mercury, both of which are false. She also noted that the current flu vaccine is a much safer one than in past years and is not a live vaccine that contains the flu virus. 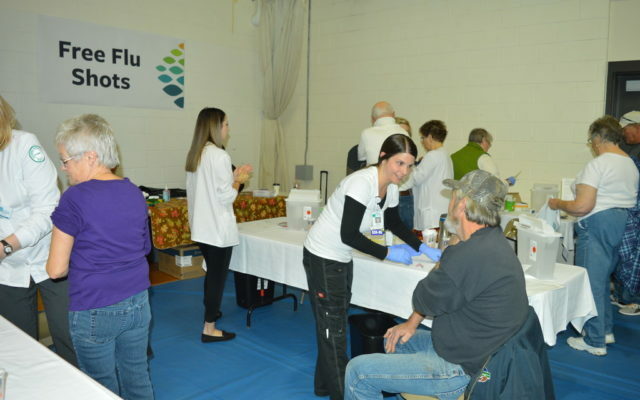 In fall 2018 Northern Light provided 1,319 free flu shots during clinics that staff members held in Mars Hill, Fort Fairfield, Presque Isle, Caribou and during their annual health fair. Foley encourages people to get their flu shot through their primary care provider or pharmacy every year. She said that it’s not too late to do so even in the mid to late parts of flu season, which typically lasts from October to May. The latest CDC data shows that only 41.2 percent of Maine residents received the flu vaccine during the 2017-2018 flu season. The national average is around 47 percent per year. If people contract flu symptoms such as a fever, chills, headaches, sore throat or body aches they should stay home until they’re no longer contagious. Foley said that the best ways to prevent the spread of flu germs are regular hand washing, coughing or sneezing into your sleeve or using hand sanitizer immediately after coughing or sneezing in your hands.